What would you do if you woke up in the middle of the night and found Earth’s largest land animals trampling your most treasured possessions? If you are a farmer in Northeast India, answering that question is no idle game — it is a matter of survival when a wild Asian elephant herd wanders out of its forest home in search of a meal, stomping through the rice fields that provide your food and livelihood. If you are lucky, the huge invaders are scared away by torches and noise. But the confrontation can turn deadly: Each year, wild elephants kill up to 300 people in India. India’s elephants are locked in a fierce competition for food, water, and living space with the nation’s fast-growing human population. Over the course of the twentieth century, India’s population has almost doubled to more than 950 million people. In their search for living space, India’s settlers have cleared all but ten percent of the elephant’s traditional forest homelands. Some Indians, however, have been taming elephants for more than 5,000 years. In The Elephant Men, NATURE follows a venerated elephant trainer named Dr. Krishnamurthy and several of his young trainees, or mahouts, in their travels 1,500 miles from their homes, as they aid a beleaguered village in the northeastern state of Bengal. To get the inside story on the making of The Elephant Men, NATURE Online spoke with filmmaker Harry Marshall. “In the opening scenes of the film, you see an elephant charging the camera, and then you see some people with torches. That wasn’t set up; all that really happened. If you look closely, you’ll see me run across the camera — with an elephant 20 yards behind me. I was chased by a wild elephant absolutely hell-bent on killing me! “The villagers had told us not to run. They said, “When the elephants come, stand your ground and face them down, shine your lights at them, and they will stop.” So that’s what we did. And when the elephants came, we stood our ground, and the entire village ran away. We were left standing there. Finally, I said, “Run!” We took off rather too late. “It was dark. I tripped and fell, and everything went black; then I was surrounded by a kind of golden light that was bathing me from everywhere. For the first few moments, I thought I had died. I was very irritated. But then I realized that I had fallen into an irrigation ditch, and the light was from my camera lamps, which run off direct current and so were still burning underwater. I spent half an hour hiding in the ditch with just my nose poking out of the water and one very angry elephant looking for me. “At one point, I felt something grab my arm. I was afraid it was a trunk, but it was Alphonse Roy, the cameraman. Now Alphonse is only 5’2”, so he was really on his tiptoes in the water. And the first thing he said to me was, ‘Shall I take a [light] meter reading?’ I thought that was a funny thing to ask. “Dr. Krishnamurthy is something of a legend in elephant circles. He’s been working as a wildlife vet for over 50 years. He was the inspiration for the whole film. He’d been asked to go to North India to solve the problem of rampaging elephants and capture them. It seemed like an extraordinary thing to ask a retired 70-year-old man to do, but it’s because there is a crisis — and he’s the only man who could sort it out. “Elephants have been used [as beasts of burden] for centuries. The first recordings of men and elephants working together date back to 3,000 or 4,000 B.C.E. The traditional work of elephants was timber extraction and hauling. It was the ultimate beast of burden, but now there are [few] forests left [in India]. Elephants were once used in warfare, but no longer. Up until the middle of this century, an elephant was the ultimate status symbol. A maharaji might have a stable of 20 or 30 elephants to show off, but these days he’ll have a Rolex watch or a Maserati. “Elephants have been losing their place in Indian culture, and the number of mahouts has dramatically declined. You have to be careful not to break that golden chain, because the whole tradition is passed down orally. There are no written instructions. The training of elephants does exist in Sanskrit texts that were written over 2,000 years ago, but the mahouts are all basically illiterate. Dr. K is a walking library of elephant knowledge. “Obviously, seeing an elephant being trained — having its will beaten out of it — is not pleasant. But I’m not there to moralize, I’m there to make a film, and to document what has happened there for thousands of years. “How long it takes to train an elephant varies. The younger the elephant is, the easier it is to train. The smaller elephants can be done in three weeks. It’s going to take months if the elephant is older and has killed three or four people, like this one very large tusker [we filmed]. He took so long to train that we ran out of time on our schedule and had to leave. Of course, with the bulk of the elephants, the training never stops, because they have an infinite capacity to learn. “The bond that develops between an Indian and his elephant is as deep as any bond that exists. Dr. K’s relationship with the elephant he called ‘The Inspector General’ went on for 20 years. As he says in the film, after it had been in a fight with wild elephants, he used to stand on its tusks and remove broken bones from its head. The elephant has a grave that Dr. K visits as you would visit the grave of a brother or friend. When I asked how he felt, he broke down. His voice expressed the depth of his emotion. “Dr. K became a wildlife vet as a freshman in university. Not many people enjoy living in the jungle, sleeping rough. He just took to it like a duck to water. They say that great elephant trainers, great mahouts, aren’t made, they’re born. Dr. K has an intuitive touch with elephants. And thanks to him the tradition will continue. He has many disciples who sit at his feet and hear his stories. “The population of Indian elephants is rising. In India they can’t just be culled the way they are in Africa, where there are no religious considerations. The skills of people like Dr. K are going to be called upon even more in the years to come. Elephants are going to be used to control elephants. The domestic ones will be used to help control the wild ones. 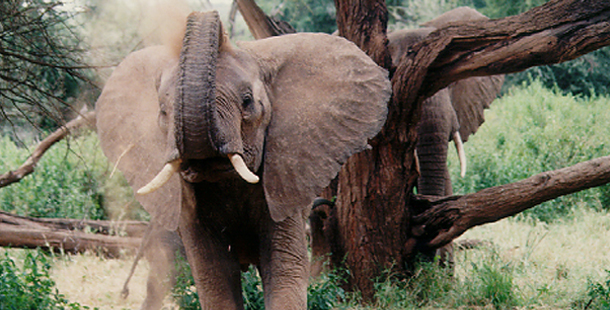 Elephants are peaceful herbivores when they’re left alone. But when a farmer empties a shotgun full of rusty nails into its trunk and the trunk goes septic, that elephant becomes a homicidal maniac. Harry Marshall, the founder of Icon Films, was born and spent his childhood in South India. He received an MA from Oxford University. He was nominated for a Best Director Emmy for his film TIBET AND THE END OF TIME. Currently, he is at work on a series for PBS about the Brazilian Amazon.